Little, Brown and Company, New York, 2014. 613 pages. This is the culminating volume of the trilogy that began with Daughter of Smoke and Bone. I’ve been waiting impatiently for it since I finished Days of Blood and Starlight. This book begins not as expected, with the Seraphim of Eretz coming to earth as a legion of angels, which happens in the second chapter. 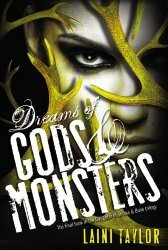 Instead, the first chapter introduces a new character, a graduate student named Eliza, who has horrible dreams of worlds being devoured, dreams involving gods and monsters. We do get back to Akiva and Karou, still in love, but pulled apart by circumstances. Now they need to work together to save earth from Jael, the evil emperor of the Seraphim who has gone to earth, pretending to lead the heavenly hosts from earth's religions, but actually planning to acquire weapons of mass destruction, to do away with the Chimerae once and for all. Can the remaining Chimerae, led by Karou and the White Wolf, and the Misbegotten, the disillusioned Seraphim, led by Akiva, possibly form an alliance to overcome astronomical odds and defeat Jael? Can they overcome their hostility and generations of enmity for a greater good? Let me say first off that this book does provide a satisfying, epic conclusion to the trilogy. We see both Akiva and Karou come into their own. And I especially like the way lowly humans Zuzana and Mik contribute their talents to saving the world. I was surprised, however, by how long it took me to get through the book. More than just the length, I think the omniscient narrator and the epic scope meant there were many places where it was easy to put the book down. The tone was a little too self-aware in spots – it called my attention to the narrator. This part was probably a good thing, overall, but I also got discouraged by the many setbacks our heroes faced. Now, they did manage to overcome almost all of them, but at times it looked too dark for me, which provided more points where I was willing to put the book down. And the author did throw in yet more plot threads that were only hinted at in the earlier books, or were entirely new, such as Eliza’s part in the bigger picture. And this love at first sight thing? This idea of soulmates knowing each other instantly despite years of one’s people being enemies? This is perhaps overdone. It makes a nice story, and I’m especially happy for the characters involved, but I was a bit skeptical. Nice, though. I can’t help being happy for those who found this Destiny, even if there did seem to be an awful lot of them. However, I do have to say that by the end of the book, the author had pulled together the various threads masterfully. She wrote an epic tale about the fate of worlds and wove it nicely with ancient religious tales. And she made us wonder: What if gods and monsters are simply souls like us, dressed in bodies that don’t necessarily express the hearts inside?